Welcome to day 3 of the 100 Blocks blog tour! yep, believe it or not they let me back in!! 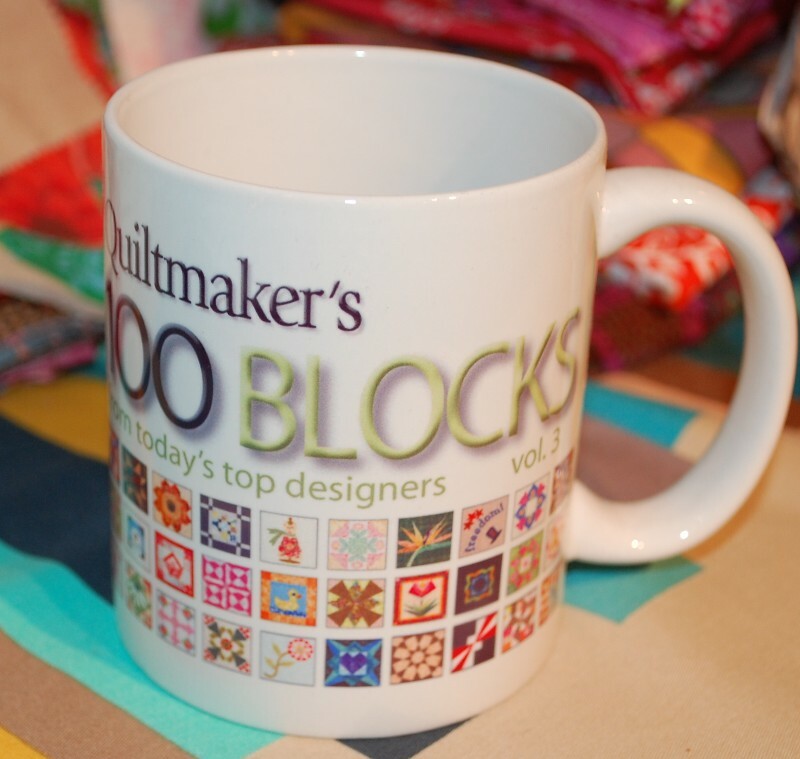 I had to get in because I saw that in Volume II, my friend Monica got a Mug for being in that volume…I was in Volume I and didn’t get one, but I don’t think the Quiltmaker folks knew what a hot seller this would be…so I am happy to say…yes, I got my mug this time!! I also got this HUGE button…. seriously, it is 6 ” across or so….I think I may string it on some selvage and sling it over my back at Market, because if it were in front it would really bug me…. What is even more amazing is….they let me in with this block! I knew that on it’s own, well, it’s rather a strange block…. Here is a little village of blocks in this wall hanging using Honey Child by Jennifer Paganelli. “appears” within the design. To be honest, I don’t remember noticing that when I designed it, but I REALLY like it now that it is done up here! …Let’s say something about your hopes for spring, or your favorite fabric this year so far, or what you want me to bring back from Quilt Market to give away…something along those lines…Comment until Saturday nite the 7th of May…I think that is the time I get my last quilt back from the quilter’s to bind for Market…whew…nothing like cutting it close…I leave Thursday at O’Dark thirty…. Here are some sneaks at some of what I have been working on ……just in case you thought I was sitting around watching reruns of Better Off Ted or something equally entertaining but unproductive….. I know they just look like piles of fabric there…..but really I have done something with most of these already and some I need to do right away when I get back from Market. So leave a comment here to win a copy of 100 Blocks and don’t forget to stop by the other blogs on the tour all week for your chance to win there as well! I will also have some for sale when I get back from Market too…and it will be available on the newsstands May 10th too. Stay tuned for some more upcoming news…I hope to be able to announce before Market….I am excited about it…I hope you will be too!! Love how your block looks in “community”! I always love blocks that make interesting secondary patterns. Wow I Love the block the fabric is beautiful! So amazed at your talent! My hope for spring is that it FINALLY gets here. Woke up this morning and it was 43 degrees in my corner of Kentucky. Enough already! Guess I’ll have to stay in and sew. Love your block and the secondary patterns it makes. Congrats on your block in the mag! My hope for Spring is that is starts happening before Summer shows up! thanks! Being from Chicago, my hope is that spring will actually make an appearance so I can leave the house with a coat. And I’d like to have spring before it’s suddenly 90+ degrees and humid! thanks for the opportunity to win this magazine! I also like the way your blocks formed an on-point design. Very clever. I would like you to bring back photos from Market to share. These are always my favorite thing since I can’t go. That is just amazing how the “odd” block becomes a work of art. I just love it. Thanks for the chance to win. I love how the block builds a village…anxious to see how mine turns out. Gotta win a magazine! my favorite fabric right now is central park. love it! This book looks amazing. Scott, I love it that all the pics on your blog are MAN-SIZE! We’re talkin’ BIG PHOTOS at Blue Nickel. So much fun! Love your block and the secondary designs it creates. Congratulations on a job well done. I am intrigued by all the fabulous fabric showing in your photos. I’m going to stretch myself this summer and make a Kaffe Fassett quilt. I usually do the Kansas Troubles/Thimbleberries pallet but I need to get out of my rut. Love your block…it looks like a divided churn dash with all kinds of possibilities. Have to say , my hope for spring is that we actually get one! Love the possibilities of your block! Love the design of the block and how it looks sashed when joined together. Very nice block. I like all the pink in the wall hanging. I am liking bright fabrics more this year and also, surprisingly the grays that are popping up. Beautiful block. Thank you for the opportunity to win a copy of the magazine! Love your block! So cute! My favourite fabric at the moment is pure from sweetwater. just love blue and brown together! I really like the Starstruck block – think I’ll try it in pastels for a baby quilt. My hope for spring is that we actually get one and not crash into summer after this soggy cool spring in northeast Wisconsin. 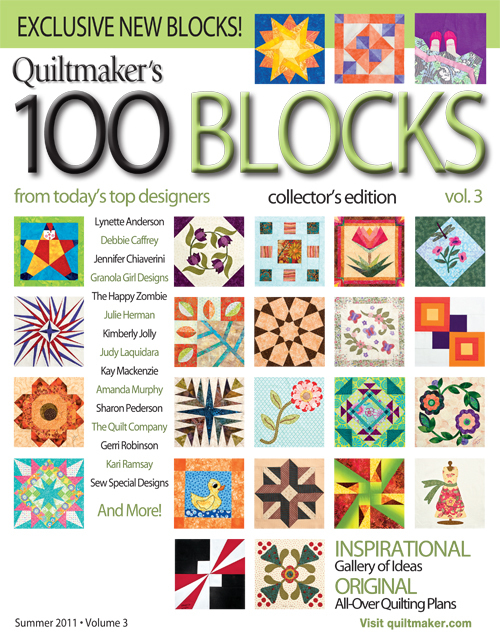 Congratulations on being in the 100 Blocks book again! I love the way the block looks when surrounded by others of the same. It is really neat! I am so ready for spring to be here in Colorado. It was snowing still as of last weekend, but it does look nice for the rest of the week. Ok, I love a good secondary design! Love the block with its siblings but now I’m wondering what this baby would do in a two block design? Perhaps with another block from the book? (or your previous one? Gotta go pull out that issue now). Oh, the idea wheels are rolling. Got to get this issue! I really like blocks that form an interesting secondary design like yours does. As for spring, I thought we were going right into summer drought except it rained Monday night and brought more normal springtime temperatures. Hoping the last of the spring thunderstorms/severe weather is done. Too much family in the south not to be hoping for no more nasty stuff. Love the block in the quilt. I must admit to not really “getting it” when I just saw the lone block, but in the quilt – WOW! Love your block, and how in looks “in community”! We have had weeks and weeks of rain, snow, gray skies…today is beautiful sunshine –I am hopeful today that spring is finally here! This block has so many possibilities of secondary patterns, depending on how it is set — one of my favorite things about pieced blocks. …and all the “eye candy” — I look forward to seeing what you made with those fabrics. I quilt and embroider both and really enjoy the creativity in your designs. This block looks like it would be great fun to work with. Congrats on getting your mug. I love how the block creates another pattern. This will be a fun block to try. Thank you for sharing. I like the quilt. I like to use asymmetrical blocks because they offer so many setting options. Great block. Love the fabric that you used. Love the block the mug and the button!! Thank You for all the hard work in doing this! Your fabrics take me back to the Partridge Family tour bus. How fun!! The block looks versatile — many uses for it. 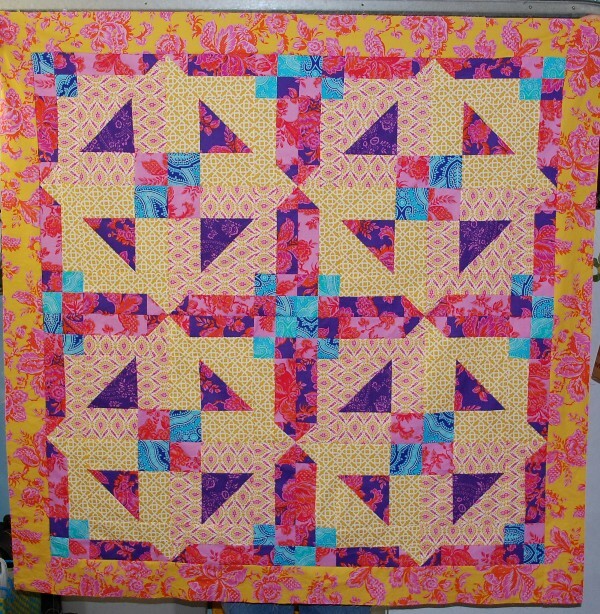 I like how your quilt turned out with this block. Thank you for a chance to win! Spring… YES! 🙂 It’s been a VERY long winter. I agree that is a sort of odd block by itself, but the quilt is quite interesting. Wonderful block, especially when it is communitified. I don’t think that’s a word, but I think it fits! My hope for spring echoes Lisa Marie – we need some warmer weather. Here in Missouri it was 36 degrees this morning. I also hope for lots of sewing time. I wasn’t sure about the block, but the setting/layout ‘ginormous block’ sold me. It looks great! Love the secondary block that forms. Love, love, love the fabrics you used. 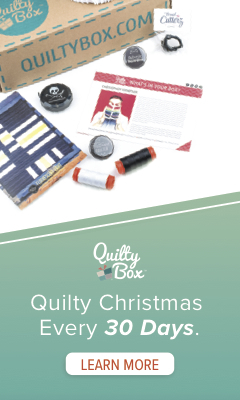 Wowza, this block didn’t make it for me at first glance… then I saw how it looked when it played with all its friends…then BAZZINGA I wanna make some! I can see it done in scrappy and in planned colors, but what a great do-able block. Thanks so much…I can’t wait to see it in the magazine so I can start sewing up a dozen or more blocks….love the pointy effect in the “sashing” that appears. I like the idea of community too, and can relate this block to being very friendly! I love spring…except the pollen…and I love the imagination you show in this block…the secondary design makes me think of the classic shoo-fly block and I’m glad you pointed out the on-point design because I missed it until you did. Keep up the good work! Great block! I love the secondary patterns it creates! When you go to the quiltmarket could you bring back some of Aneela Hooey’s new fabric???? I love that block. I love the secondary patterns. Love the block and the way it communes with others in the larger pattern. For spring, I’m hoping for world peace and that I finish my niece’s graduation quilt on time! Glad you got your MUG and the Big Button to wear at Market. 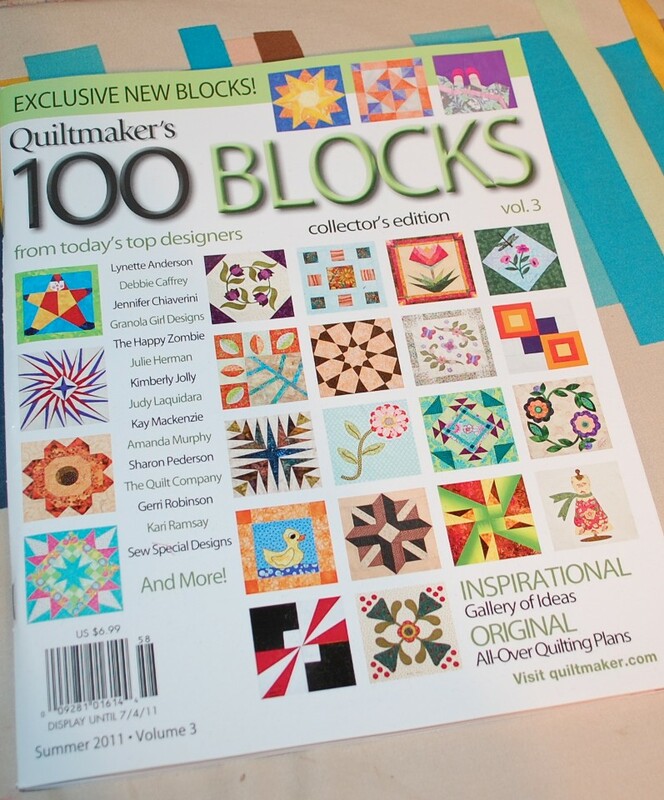 Have fun and Pick me to win the copy of the 100 Blocks MAgazine so I can make all the fun blocks. I like your setting! I like your block and the secondary design that is made when several blocks are put together. Thanks for a chance to win a copy of this magazine. My hope for spring is that it arrives! I volunteered to take my daughter’s Brownie group camping this weekend – in TENTS. Little did I know back in January we’d have the coldest spring on record. I love your block and want to make it a mini for a small quilt – wouldn’t that be cute. Can’t wait to see what you are up to with all those yummy fabrics! I’ll be following your blog to find out! I was surprised at how your block looked in a quilt! Congrats on a great block! Love the way your block works out! I like your blog too! You really should bring back some fabric from Market. 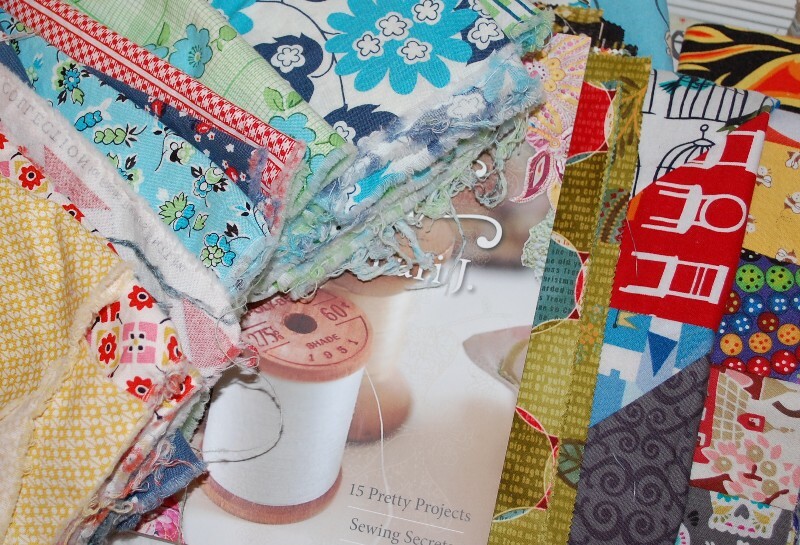 There’s not a quilter alive that would take some more fabric!!!!! Your block does look good in a setting with others. But I think it stands alone really nicely, too! I have given up on hoping for spring. I have moved on to hoping for summer to come. Soon. Love it! Thanks for the chance! I’m liking Summer Breeze by Moda. How about some thread from Market for a giveaway? Bring back pictures of all of the great designs and ideas you’ll see at quilt market. So much creativity packed into one place seems to me to be very exciting. I really love that small butterfly print and all of the beautiful prints you showed. I do mostly primitive quilting, but getting into art pieces and loving all the new fabric lines. My hope for Spring is that my husband can find a car he can afford, so I can have mine back, lol. Then I can get out and enjoy all this beautiful weather. Love the mug! I can see why you would have to have it. Oh, and the block is fun too! You have to be proud for beeing featured in the magazine, and that mug oh my is just wonderful. Great fabric and a fantastic block/quilt. I loved getting to see your block put together with others–so pretty! It’s definitely hard to pick, but I’m going with Hoopla! It is such a bright, happy block. Love it in the wall hanging. Oh heck … I had my comment all planned out and looked up and Wham …. Lisa Marie said the same thing I was going to!! 🙁 LOL LOL Really where is Spring? We had snow on Monday for goodness sakes! Bari’s fabrics are worthy of being sold out. As for what to bring back from Market … how about yourself in one piece not having been run over during Sample Spree … beyond that, anything you manage to return with is bonus! congrats! I wish I could get a mug too. They are so fun. Great block. Thanks for showing it in a quilt which looks pretty cool when put together with other blocks. I just found your site through the Quiltmaker 100 Blocks Blog Toiur and I like the way your block makes such interesting secondary patterns. Spring has been here in southwest Georgia for awhile and I have been enjoying the nice weather. It makes it hard to stay inside. Thanks for the chance to win a copy of the magazine. I really like how you used your block in your setting..very different! Congrats of getting in Vol 3 and getting that cool button and mug! Thanks for the giveaway. Boy, you are really tantalizing us with all your cool fabrics for this neat block! I, too, love the secondary design phenomenon. It’s like a bonus you get for playing nice! Love the block. Congratulations on achieving mug status! fabric is always a good giveaway, though I really would like this book! I had to chuckle at your “O’Dark thirty” comment about when you’ll be leaving for Market. I usually am up at that time and padding around waking up so I can do some crafty thing!! I’ll be thinking of you on Thursday. Love your block. Bring home lots of pre-cuts from everyone!!! Or as many as you can put in your suitcase. Wow, don’ you just love it when you find a secodnary design you didn’t really know was there? A member of my quilt guild made a quilt using the exact same block as mine but with the values placed differently. We both brought our quilts to guild the same night and realized what we had done — talk about serendipity!!! Oh, forgot the rest of your request — how about some 12 weight thread, like the new Aurafil? Great block. Love this whole idea. Love your block. Some of my favorite fabric lines is Sherbert Pips, Bliss, Sunkissed to name a few. When I saw your block I had this puzzled look on my face and then there was the “ahhh” moment when I saw the village of blocks put together! And I really like the block that looks like its on point in the center. My hope for spring also is for it to get here. We have had unusually cool temps 95% of the time. At least the bad weather hasn’t been here. Love the block when put together. I like the secondary design with your community of blocks. Great plan! lol Thanks. Waiting for spring to arrive. Some flowers have bloomed but the rain sure does make it yucky. Your block is really nice. Spring has already come and gone here, it lasted about a week then it hit the 90’s. It’s going to be a long summer. I like your block and can’t wait to play with it to see other lay outs. Thanks. Great block makes neat quilt. Thanks for sharing. Love your block, I feel like a little kid when I get to see a block do all different things with placement of color. Your fabric pics had some type of animal (cow, moose, donkey?) in red on what seemed like a blue background – what is that? From market for giveaways…fabric bundles and new patterns, autographed books are always nice too! For Spring, my hope, hope, hope is that I get my garden beds to look wonderful with a mix of veggies and amazing flowers to cut every other day! What a lovely block! Congrats on it! 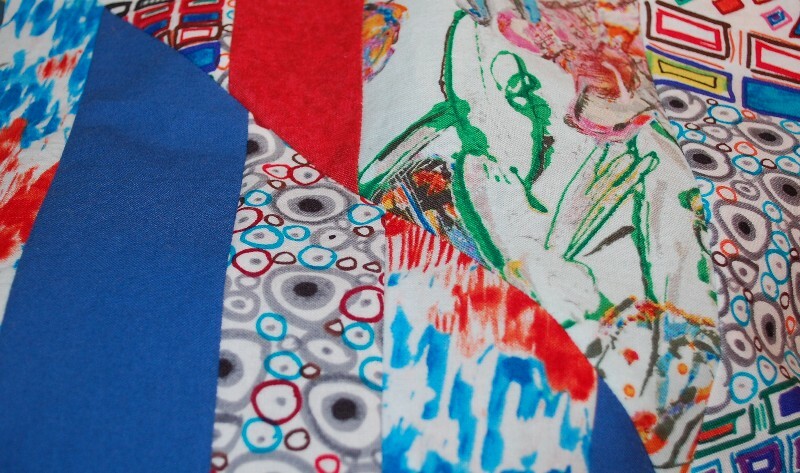 I love the fabrics you use in your blocks, and they way they all come together. My favorite fabric this Spring is Central Park by Kate Spain. Love your block!!! It would look good in any fabric! Thanks! I just want more sunshine for spring at this point!! I like the secondary patterns created by the block in it’s community. Congrats on making the book and getting the mug. Congrats on block, mug and button! I love the way this block works up in a quilt! Thanks for sharing! Wow, I love your ‘village’! We don’t get that magazine where I live, so I’m really hoping I’ll win!!! This is one fantastic block. Please grin and have another cup of coffee in your well-earned QM 100 Blocks v3 mug! Today was flipping through a magazine in Wal-Mart, and there was the Ty Pennington article with your quilt in the bottom corner. Told my mother – see – I read his blog! I love the larger pattern that you blocks make when put together! Right now, I’m loving Sugar & Spice by the Quilted Fish for Riley Blake. This is for the Quilt Market question. Please return with new fabric collection bundles / charms, new thread, new books, and new nifty notions – or photos thereof. Plus, would love to see all those quilts you have been working upon so hard — in the context of their display at Market. Best wishes for a safe trip. What a great looking block and yes, the illusion of it being on point is very cool! Hmmmm something about Spring? Ummmm WHERE IS IT? Yea, Northern IL and we had frost warnings last night and again tonight. 🙁 And what can you bring back from Market for me? Well, see if you can find one of those awesome mugs that someone isn’t guarding. LOL OR you can just send me yours. 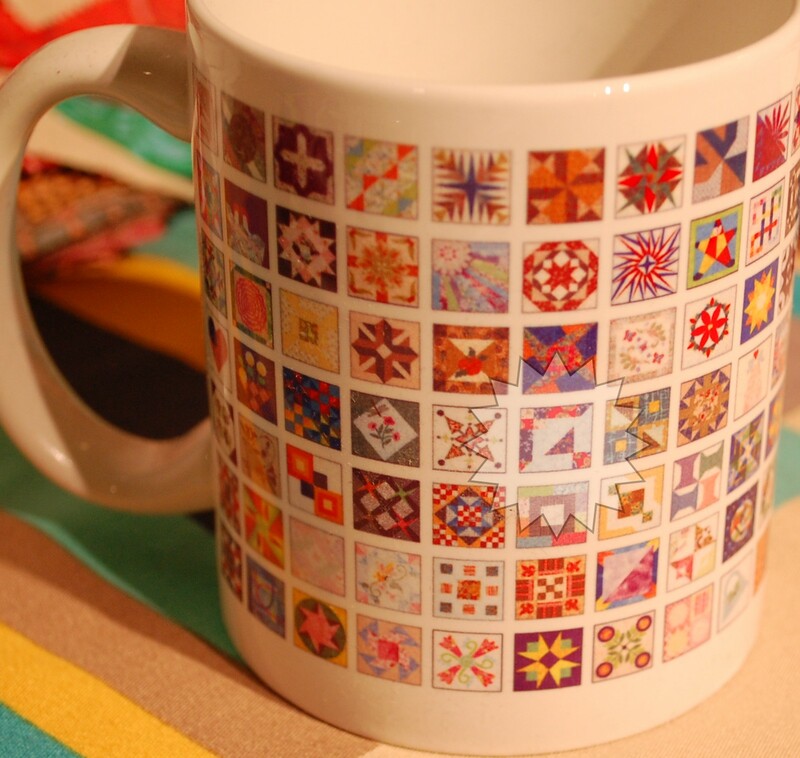 ha I think the people at Quiltmaker should be giving some lucky winners one of those mugs. I KNOW I’d love to have one myself and I surely cannot be alone. Have lots of fun at Market and for the shoes ~ maybe since no one cares about your shoes you should find some heels and see if they pay attention to those Scott. LOL I would be willing to bet they’d surely check out your shoes every single time they see you after you showed up in some heels. Hey congratulations on getting a mug this time!! At least they did not forget you this time ! he he The block is amazing in the quilt. Looks good, can’t wait to get my copy of patterns. I really like how your block looks with others in the setting. It’s very cool! And for Spring, my hopes are that we stop with this crazy weather!! Ah, Spring….the birds chirping….the flowers blooming….the christmas quilting fabric being released…. Hope your trip goes really well. 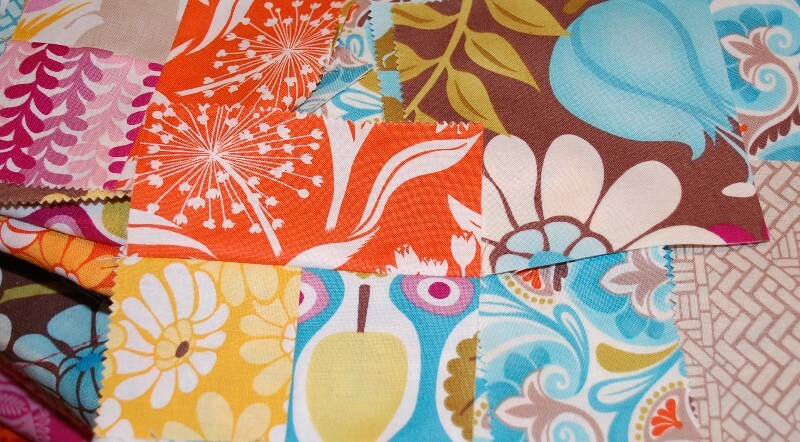 My hopes for spring are to finish an applique quilt that I’ve been working on for a while. I love secondary designs, so your block is one of my favorites so far! I am looking forward to spring and all the new flowers blooming. My new favorite fabric line at this time is Sherbet Pips. I love the secondary block that is formed. You made a great block. What an amazing block. With Spring I am looking forward to some lovely dry sunny warm days. It has certainly been a long cold winter. I love the design from your block layout and the way it looks like there are more blocks than there are. very nice block. I like how it makes a “point” too. I love the secondary pattern that your block makes! Gorgeous!!! love the pattern it makes when put with other blocks. I wish we’d stop getting nice days of Spring here in Idaho, followed by yucky days of winter still. It needs to be spring already! I loved the paris fabrics inspired by the gardens there. Can’t think of the name though sorry. What a cool block! And I’m glad you got your mug! Congrats for being in the magazine. Seeing all these blocks is so much fun! I have to admit…I thought the block a little different, too. (Notice i didn’t say strange…) But seeing it with all the other blocks….it’s absolutely wonderful!! And I love it! Who knew?! I’d love to win a copy of the book. The block looks great in the setting you did. Makes me want to pull out some of my stash. Thanks for sharing. Hoping that the coming months bring back a much more robust economy. I love the secondary design in your blocks. Congratulations on being in the magazine. I am loving the Sherbet Pips collection. My hope for Spring is that it will arrive soon. There is snow in the forecast here in Northern New York. I need some nice weather and lots of sunshine. I enjoy blocks with bonus secondary patterns. Your block alone is not impressive, but when shown off as a set, it looks great. Hmmm, Spring is almost over here. Lilacs, magnolias and flowering cherries have bloomed; mexican orange blossom is out as are the first of the roses and the paeonies. As for Market – two words. Prince Charming! or Silent Cinema or Honey Child or Moda’s Amelia, Terrain…….. oh heck brain has gone completely blank! Beautiful! For spring I’m looking forward to getting the yard in some kind of shape. I’d love to have my little area out back pretty and ready for coffee in the mornings. So glad you got that great looking mug this year! Your block would be great for a scrap busting project. I love blocks that make interesting secondarly (to introduce a son-like word) pattern. I also like surprises when I piece my quilts together. Thanks for all of the sneak peaks! My life is so busy right now I wouldn’t even know what to suggest you bring back…just make it lively, hmmm? My hope for spring…I hope it comes. We have been waitng a loooong time in MN for spring . Well Spring is a long way off here – it is Autumn in Australia but I do have great hopes for winter and for the coming spring. For winter I hope to spend more time tucked up inside sewing away from the cold and for spring I hope to have a lovely quilt for my babies first birthday. 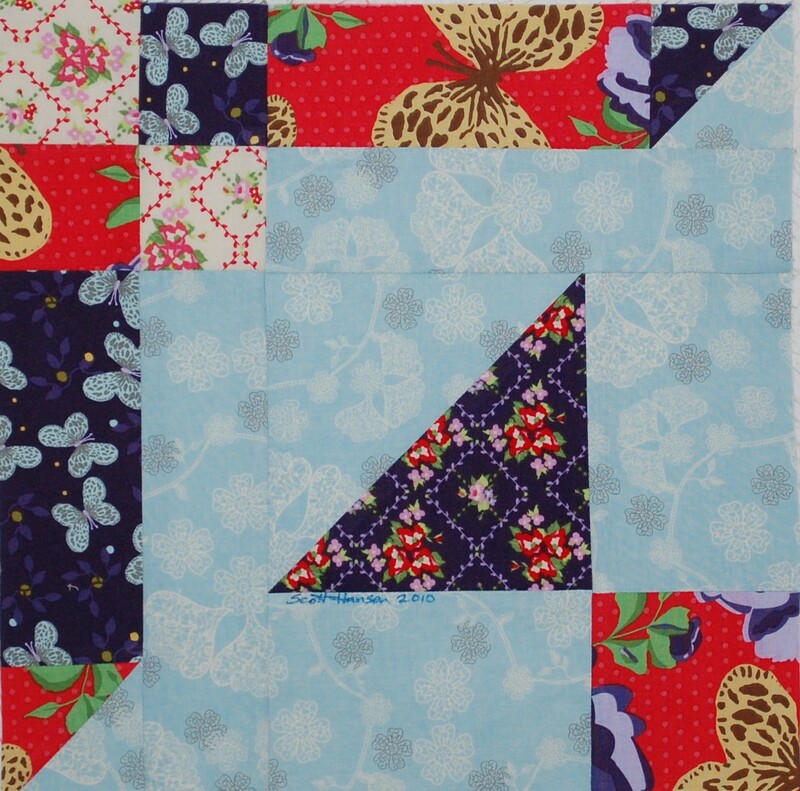 your block is wonderful, and done up in the Jennifer Paganelli fabric it’s GORGEOUS! i’m hoping to find more time for sewing this spring, but isn’t that what we always want? 😉 fabric wise, i’m totally loving Ruby Star Rising – anything with linen makes me swoon! my surprise love was hoopla by moda. i bought a charm pack for the hell of it, and fell in love with the bright colours and the teensy cherry print. Love all the possibilities with your block scott. And can’t wait to see what you’ve come up with out of those fabulous fabrics…I see a peek of Central park and a new Christmas line, oh fun! Love how your block looks all made up. Would be fun to experiment with different colors – like those AWESOME bright colors in that first pile in your post. Can’t wait to see what they are. 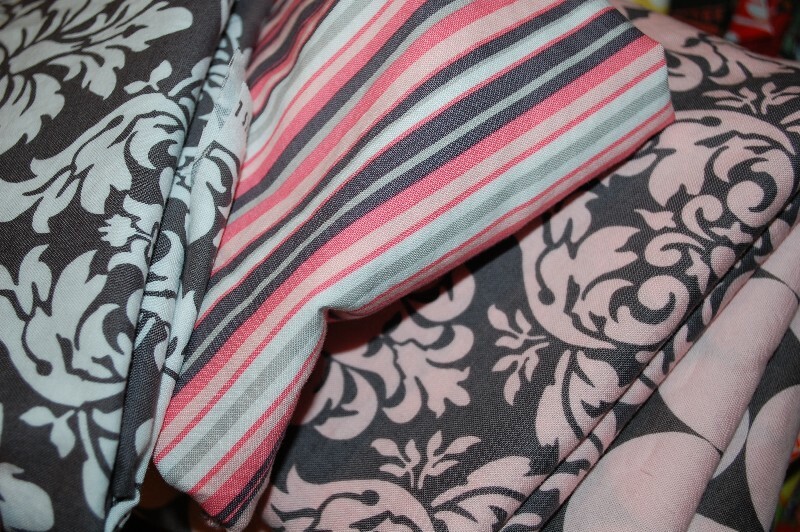 sherbet pips is my fave fabric so far this year….i think! I love your quilts and how they come together. My hope for spring is that I lasts and doesn’t go away too soon, summers are so hot and dry here, I’d like the nice weather to last a bit.